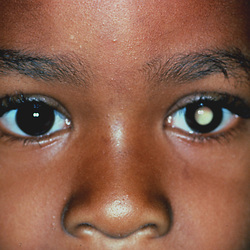 Retinoblastoma may present with symptoms and signs such as pain in the eyes, white’s cat eye pupillary reflex ( a white reflection seen through the pupil), reduction in visual acuity, the present of intraocular mass and strabimus. The treatment of retinoblastoma may include surgical tumor removal and radiation therapy. Retinoblastoma is form of tumor that affect young children and arises from the neuroepithelial cells in the retina. Retinoblastoma may present as tumor with the cells arranged in Flexner- Wintersteiner rosettes.The tumor cells may present as round cells / cuboidal cells, with hyperchromatic nuclei. Retinoblastoma may be sporadic in nature of familial/inherited in nature ( autosomal dominant trait).Retinoblastoma is caused by the homozygous deletion of the alleles coded for Rb gene ( homozygous deletion). Rb gene is a chromosome 13 tumor suppressor genes. The complication of retinoblastoma may include the metastasis of the tumor to lymph nodes, brain spinal cord and bone with the possibilities of developing osteosarcoma in cases of familial bliateral retinoblastoma. 1.Reid, Ted W., et al. "Characteristics of an established cell line of retinoblastoma." Journal of the National Cancer Institute 53.2 (1974): 347-360. 2.Hansen, Marc F., et al. "Osteosarcoma and retinoblastoma: a shared chromosomal mechanism revealing recessive predisposition." Proceedings of the National Academy of Sciences 82.18 (1985): 6216-6220.